Superheroes and their antagonists do a lot of talking. Lots of speeches about inner turmoil, taking over the world and the fate of the universe. But what about the smaller, more mundane conversations they might have off-screen? Well, they use SMS for that. Duh. 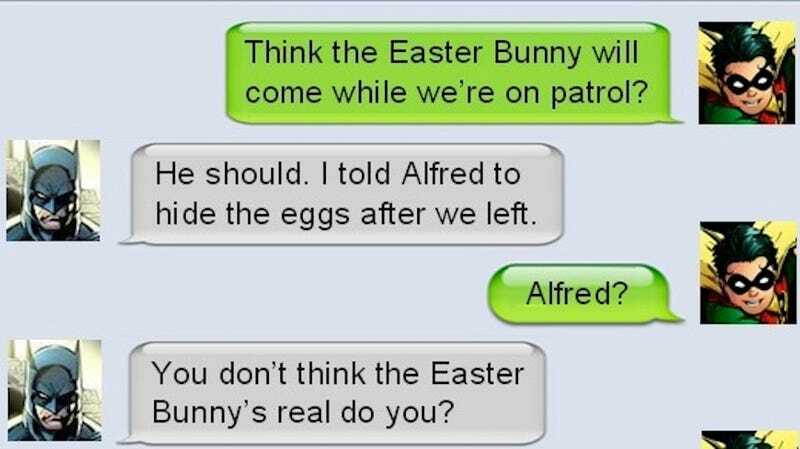 The funny fake convos over at Text From Superheroes—the brainchild of internet comedian Diana McCallum and stand-up comedian Andrew Ivimey—offer a glimpse at what Batman, Superman and other metahumans might chat about when they’re not trading punches. The amount of laughs varies widely but you have to admire how much nit-picky nerditry is behind the whole affair.